Secretary of Homeland Security Kirstjen Nielsen released new numbers that border arrests spiked to 75,000 last month alone. That's up 80 percent over last February. The move follows an unsuccessful compromise that would have affected presidential power in future administrations. After last minute deal-making cratered between senators and the White House, the president is preparing to override this bipartisan rebuke. "I'll veto it. 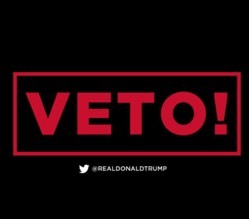 I'll do a veto," Trump promised even before the Senate vote, dismissing its effect. "It doesn't matter." Not all Republicans share that view. Sen. Mitt Romney (R-UT) said, "For me this is a constitutional question. This is not about the president or border security." House Speaker Nancy Pelosi (D-CA) is set to send the measure against the president to his desk, even without the necessary votes to overturn a sure veto. Pelosi described Trump's border order as an "unconstitutional measure that does violence on the Constitution." As the battle over whether it's an emergency rages on, the White House released a video from Customs and Border Patrol showing 247 illegal immigrants crossing into the United States at the beginning of the year. Adding to those optics, the White House sent Vice President Mike Pence to see US Customs and Border Protection in action this week. "With the crisis we face on our southern border we are particularly grateful for Customs and Border Protection," Pence said. Joining Pence, Secretary of Homeland Security Kirstjen Nielsen released new numbers that border arrests spiked to 75,000 last month alone. That's up 80 percent over last February. Pence said, "Very dangerous work at our southern border at a time when we are seeing an unprecedented influx of people being driven by human traffickers, drug cartels."